First developed 80 years ago as "Rowntree’s Chocolate Crisp," the Kit Kat bar has become a staple in grocery and convenience stores the world over. And while the marketing slogans and catchy jingles have changed over the years, that shareable chocolate-and-wafer design hasn’t. So take a break from whatever you’re doing and indulge in a few facts. 1. THE NAME ORIGINATED IN THE 17TH CENTURY. Founded in the late 1690s, London’s Kit-Cat Club was a gathering of Whig party supporters and literary minds that met regularly at a pie shop on Shire Lane. The owner, Christopher Catling, specialized in making meat pies that everyone called "kit cats," after an abbreviated version of his name. Fast-forward two centuries when Joseph Rowntree, co-founder of the Rowntree’s candy company, zeroed in on the name and secured the title trademark in 1911. It’s not clear whether the famous club directly influenced Rowntree or not (or whether the popular Kappa Alpha Theta myth—that Rowntree's wife was a sorority member, and the name was an endearing acronym for Keep In Touch, Kappa Alpha Theta—had any part). In any case, the term "kit kat" had seen a resurgence in jazz age London. There was a Kit Kat nightclub at the time, as well as a Kit Kat band that drew regular crowds. 2. IT WAS ORIGINALLY A BOX OF CHOCOLATES. After trademarking the names “Kit Kat” and “Kit Cat” in 1911, Rowntree proceeded to sit on them for a decade. In the 1920s, he came out with boxes of chocolates called Kit Cat that appeared on shelves for several years before being discontinued. In 1935, Rowntree’s introduced a chocolate wafer divided into four sections, or “fingers,” and called it Rowntree’s Chocolate Crisp. 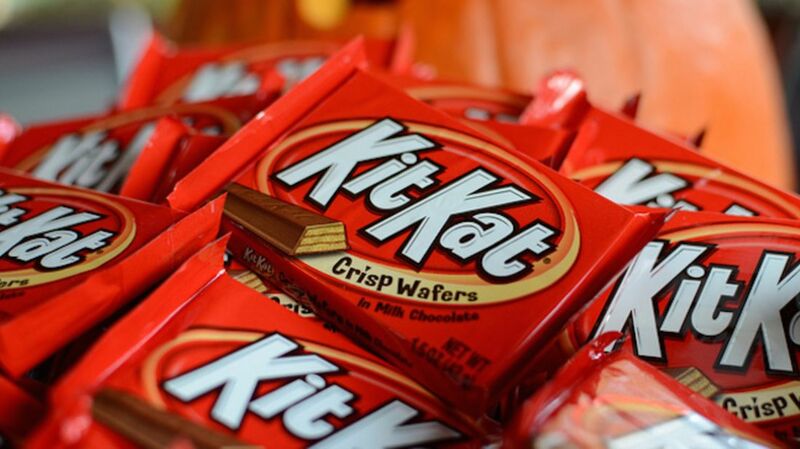 Two years later, the company changed the name to Kit Kat Chocolate Crisp. 3. IT WAS MADE TO ACCOMPANY PACKED LUNCHES. 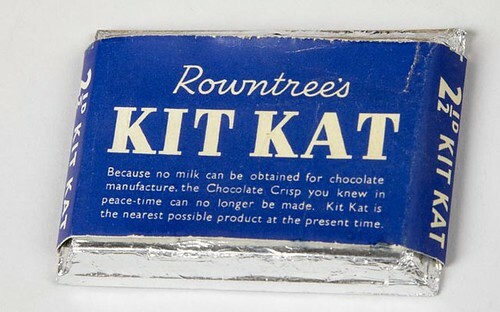 The Kit Kat’s unique square-ish shape came about because Rowntree’s wanted to make a bar that workers could stuff inside their lunch sacks. An employee at Rowntree’s proposed the idea: “A chocolate bar that a man could take to work in his pack up (packed lunch).” The company developed the shape, further distinguished it by dividing it into four sections, and wrapped it all inside bright red packaging. 4. AND TO GO WITH A CUP OF TEA. In an age when candy bars were often promoted as meal replacements, Rowntree’s marketed Kit Kat bars as “the biggest little meal.” To appeal to those who preferred it as a snack, Rowntree’s also came up with the slogan “the best companion to a cup of tea.” That concept of taking a tea break would help inspire an even more effective slogan in later years. 5. THE WRAPPER WAS BLUE FOR FIVE YEARS. 6. THE “BREAK” CONCEPT CAME OUT IN 1958. In the '50s, manufacturing innovations helped firm up Kit Kat bars to where breaking one apart made a distinctive snap. That inspired an ad man with J. Walter Thompson in London, who combined the “breaking” sound with the company’s long-running “tea break” theme to develop the slogan, “Have a Break, Have a Kit-Kat.” First used during a Kit Kat television ad in 1958, the phrase is still used in British ads today. 7. THEY’RE MADE BY BOTH HERSHEY’S AND NESTLE. Switzerland-based Nestle bought Rowntree’s in 1988, giving it control over the Kit Kat global brand. A previous licensing agreement between The Hershey Company and Rowntree’s, though, meant Hershey’s had the right to license production of Kit Kats in the U.S. So while Nestle manufactures Kit Kats throughout the world, Hershey’s holds down manufacturing in America. 8. RESEARCH HAS PROVEN THE CATCHINESS OF THE "GIMME A BREAK" JINGLE. Just mentioning that song probably lodged it firmly in your brain (sorry about that). Researchers at the University of Cincinnati show you’re not alone: They polled several hundred subjects to discover some common "earworms," or songs that people simply couldn’t get out of their head, and the "Gimme A Break" ad jingle, which first aired in 1986, was a common offender. The study, which was conducted in 2003, also called out "Y.M.C.A," "Who Let the Dogs Out," and the Mission: Impossible theme song. 9. THE SIZE AND NUMBER OF KIT KAT “FINGERS” VARIES THROUGHOUT THE WORLD. For years, Nestle has sold a three-fingered Kit Kat in the Middle East to align with local currency, while in Japan there’s an extra-long “stick” as well as a half-finger “petite” variety. In Australia and New Zealand, there’s a 12-finger Kit Kat Block built for sharing. 10. THERE ARE SOME DECADENT VARIETIES ABROAD. In the U.S., Hershey’s has stayed pretty conservative with its Kit Kat flavors, offering white and dark bars in addition to milk chocolate and a few seasonal options. Travel abroad, though, and you might stumble across a cheesecake Kit Kat, or a cookies and cream version. In the Philippines, you might find a Kit Kat Drumstick, which is basically an ice cream cone with a Kit Kat wafer jammed through it. And in the Middle East, Pizza Hut restaurants once offered miniature Kit Kats wrapped in pizza dough. If you're willing to shell out more than usual, you can even order many of these flavors online. 11. JAPAN HAS MORE THAN 200 FLAVORS. Countries like England and the Philippines may have some interesting flavor riffs, but for sheer variety, none of them come close to Japan. There, Kit Kats come in regional flavors like yubari melon, corn, and green beans and cherry. There are also national staples like miso, green tea, and the most popular flavor of all: soy sauce. Part of the appeal stems from Kit Kat’s completely unintentional similarity to the phrase Kitto Katsu, which translates as “surely win” in Japanese. Over time, Kit Kats have become a popular good luck charm and gift. One tradition involves sending special Kit Kat postcards to college students just before big exams. 12. JAPAN ALSO MADE A “BAKEABLE” KIT KAT.